"La Siciliana", fried pizza. - Benvenuti su tourguideinsicily! 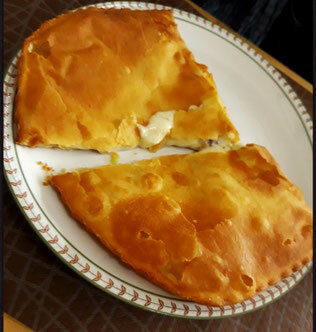 "La Siciliana", also called fried pizza, It is a gastronomic product for a hot table, made with a leavened dough envelope, which contains inside a stuffing based on Sicilian cheese, the "tuma" and anchovy pieces. Half-moon shaped, the Sicilian embodies the spirit of Steet Food and is much appreciated for its simple and intense flavor at the same time, and should be enjoyed just fried. For this reason, in the most famous takeaways there is no counter, but the moment must be ordered and fried in huge and characteristic containers. In fact, this delicacy, if done properly, does not absorb the grease at all. So we will have a fried that remains dry and fragrant with a very tasty filling. A true delight for the palate, a story of Sicily in a mouthful!